A team leader who believes that science can lay a pathway toward a shared vision of a healthy ocean. She stands for the creativity and innovation that arise when we listen and respect each other. After nearly 10 years as an academic scientist in the Caribbean, Liz jumped at the opportunity to craft a new role for science in ocean resource management. She continues to launch programs, partnerships and research that can give us all the tools needed to plan for our ocean’s future. She is motivated by Ocean Science Trust’s unique partnerships at the nexus of research, technology and local knowledge systems. 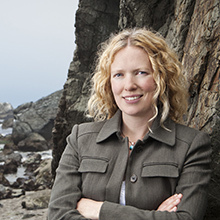 Liz earned her PhD in marine evolutionary ecology from the University of East Anglia, U.K.
Liz brings deep experience with environmental issues affecting California’s coast and ocean including sea-level rise and ocean acidification. Over the past decade, she has built strong partnerships with the State of California and philanthropists to advance urgent environmental policy work in service of all Californians.